Exactly as the name describes, a fine fuzzy coating covers this beautiful plant. Pale mid green shades are distinctive, as is the formation of many offsets and flower stalks. Ultimate size is around 15cm (6-7") for the main rosette, but can form a cluster of smaller rosettes up to 30cm (12") across. As a slow growing variety it is not unusual to keep this one for many years in the same sized pot, only replacing part of the soil each year to prevent 'soil sickness'. Easily propagated by removing offsets to pot up separately, or from the leaves which drop if the plant is jostled in handling. 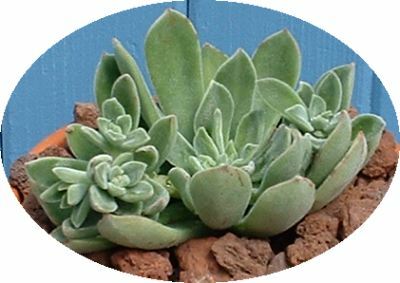 Care is similar to all other Echeveria, although as this has hairy leaves, warm water preferably captured off the roof during a rain shower will prevent marking of the foliage with water spots and mineral deposits. A bright well ventilated location is best, to show off the glinting hairs in the sun. Combine this one with care, avoiding planting it in combination with some plants in the blue range such as Echeveria elegans. Plant in a grouping with plants in darker or purple shades such as Echeveria racemosa atropurpurea 'Brown Sugar', Echeveria 'Harry Watson' with the smooth foliage in a similar shade, with the tiny Senecio rowleyanus or String of Pearls that looks like green peas on a necklace draping over the edge.